Parboil the potatoes in salted water for about 3-4 minutes, no longer. Meanwhile in a 375 degree F oven, heat a baking pan of sufficient size to hold your potatoes without crowding them. A glass or metal pan is fine, as long as it is well heated beforehand. This will help to prevent the potatoes from sticking to the pan. After parboiling, drain the potatoes and let them stand for 5 minutes. Then toss the potatoes with the lemon juice. Toss together so that the potatoes absorb the lemon juice. Transfer the seasoned potatoes, garlic and oil to the hot baking pan. These should sizzle as they hit the pan; a good indication that they will not stick. Roast the potatoes for about 60-75 minutes or until they are nicely golden brown all over, turning them every 20 minutes or so. After the first 10 minutes, give the pan a shake to make sure the potatoes are not stuck to it. 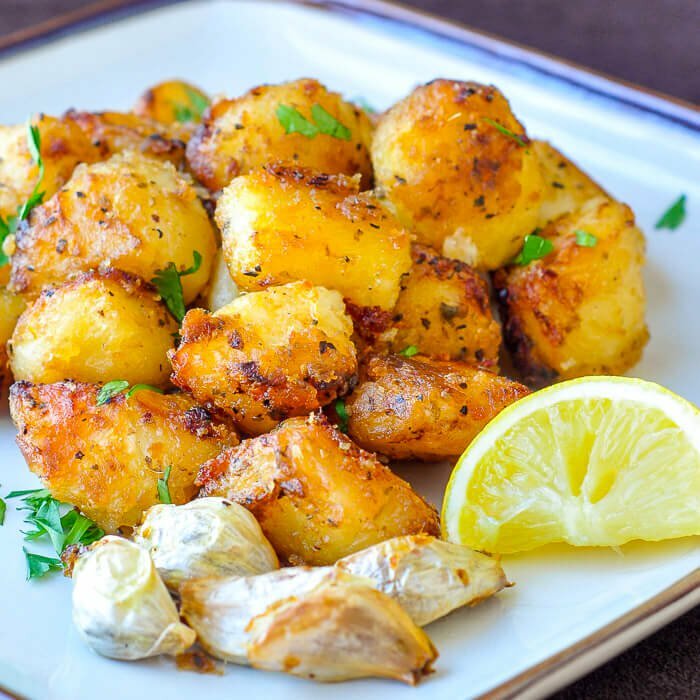 The roasted garlic may have to be removed before the potatoes are finished as it generally cooks faster.